I was commissioned for this project by one of my favorite coworkers, Big Mama. Big Mama takes real good care of all of the fine folks at my 9-5, including yours truly. She makes sure we all have our allergy meds and that our parties are planned and that we have lunch or snacks or sodas or whatever the heck else our little hearts desire. So when she told me she was redoing her bathroom and couldn’t find a mirror in the right color, I was all over helping her. I’ve actually done some curtains for her before (using this method) so she took no issue with having me customize something for her home. 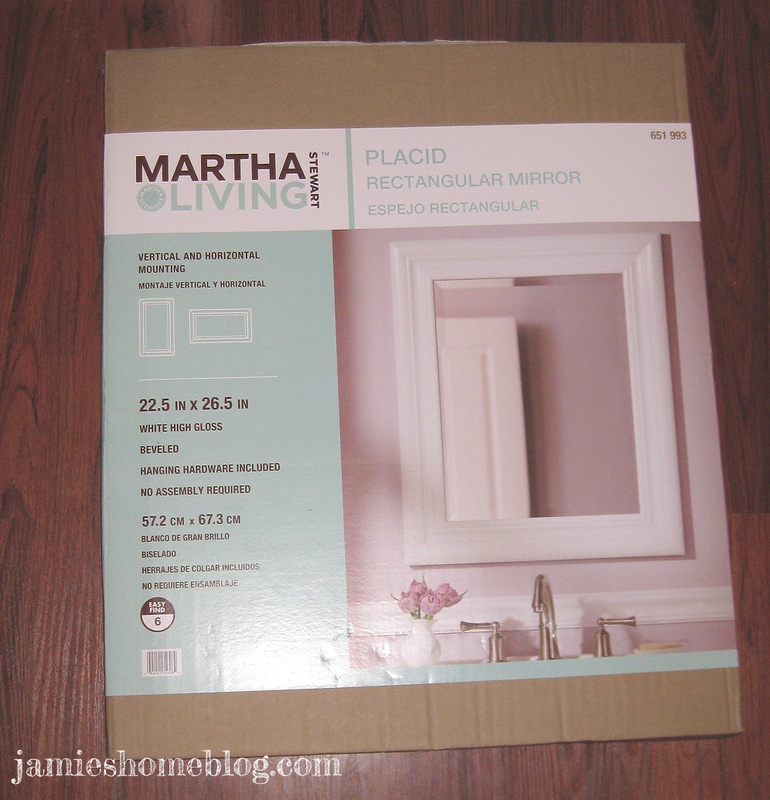 We discussed a few different options online and different stores she could visit and then she returned to me with a nice, simple mirror from Martha’s line and a swatch of the color she wanted it to be. Problem was, none of the spray paints capable of adhering to plastic were remotely close in color to what she wanted. 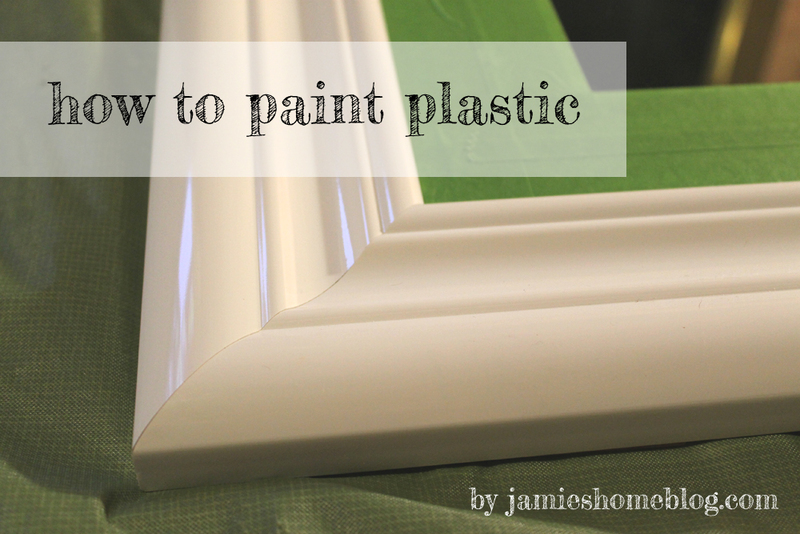 That’s okay though, because it gave me the perfect opportunity to show you how easy it is to paint plastic with latex! 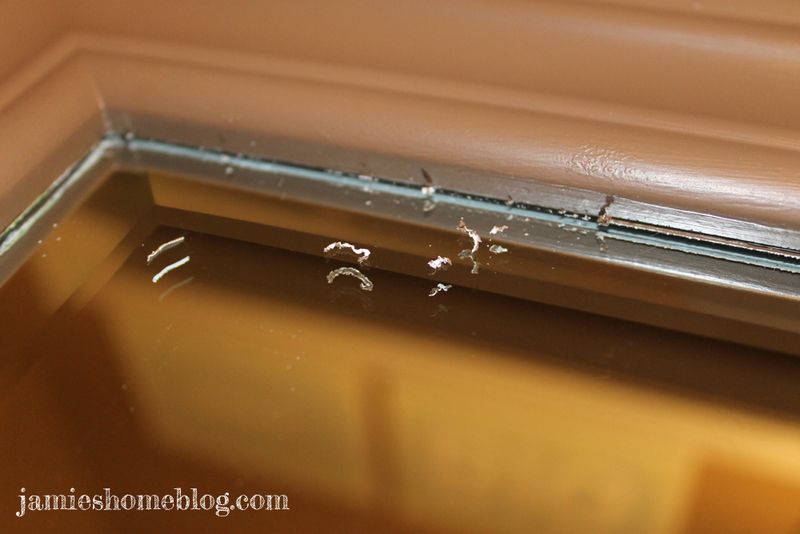 First things first – if there is any area of the plastic item that you don’t want painted, you’ll need to tape it off. In my case, that was the mirror. To secure the tape edge and prevent bleed through, I used a plastic putty knife and gently pressed all the way down the length of the tape. 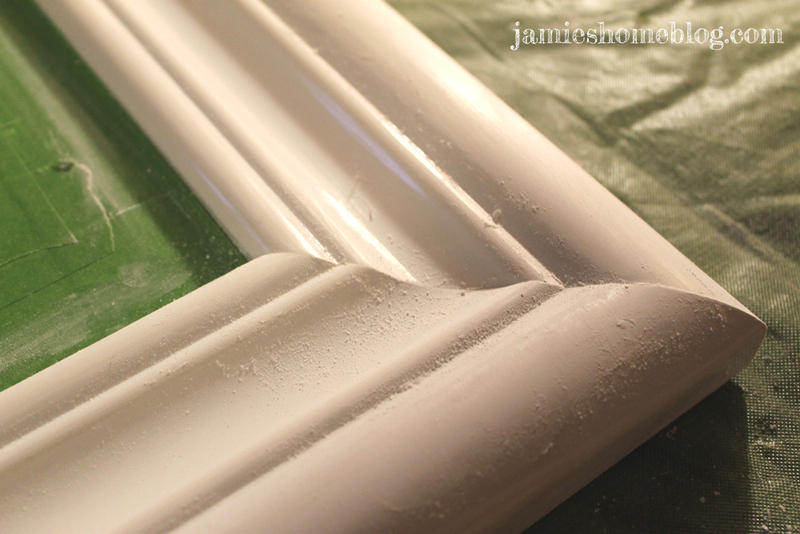 Then I took fine grit (220) sand paper and lightly scuffed the plastic frame. You don’t have to go wild with it, just enough to remove that smooth sheen. Make sure you wipe your sanding dust off with a damp cloth. 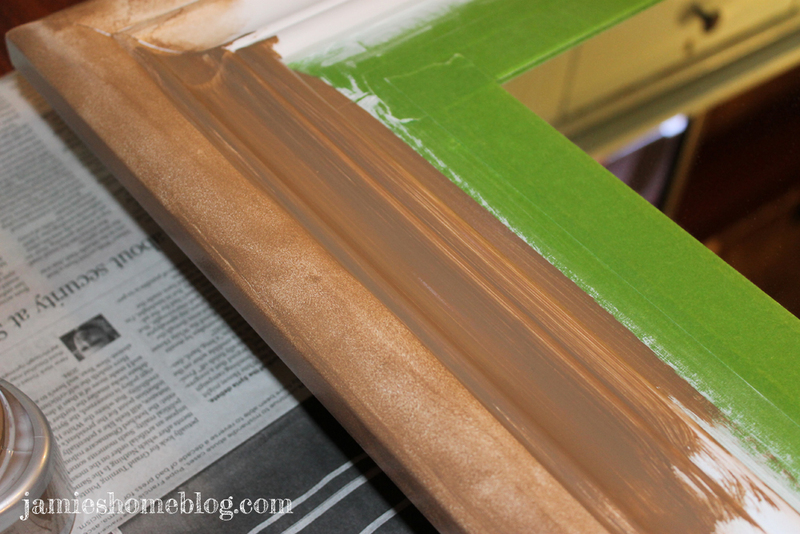 Zinsser B-I-N oil based primer is incredible. It will stick to anything. Just make sure you use a good brush for oil based paints (I prefer Blue Hawk). FYI – as with all my posts thus far, this is not sponsored. I’m just showing some love to brands that work well for me. 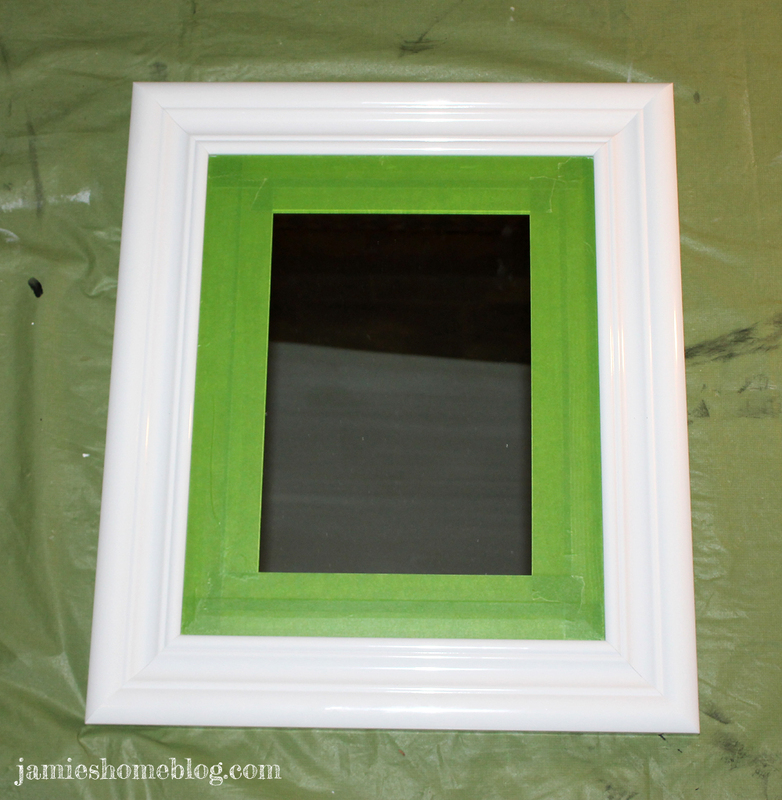 It was a bit of a pain to paint white primer on a white mirror, so if your plastic surface is white, you may want to consider tinting your primer. Once your primer dries – it’s time to paint! 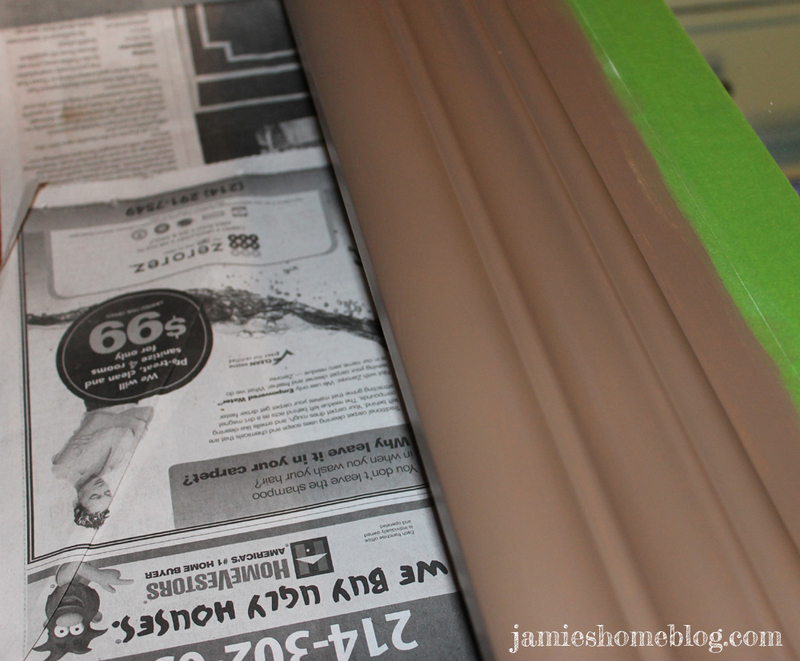 Cutting latex paint with Floetrol lengthens dry time and reduces brush strokes. Sometimes I don’t mind brush strokes. It can enhance the look of certain pieces. 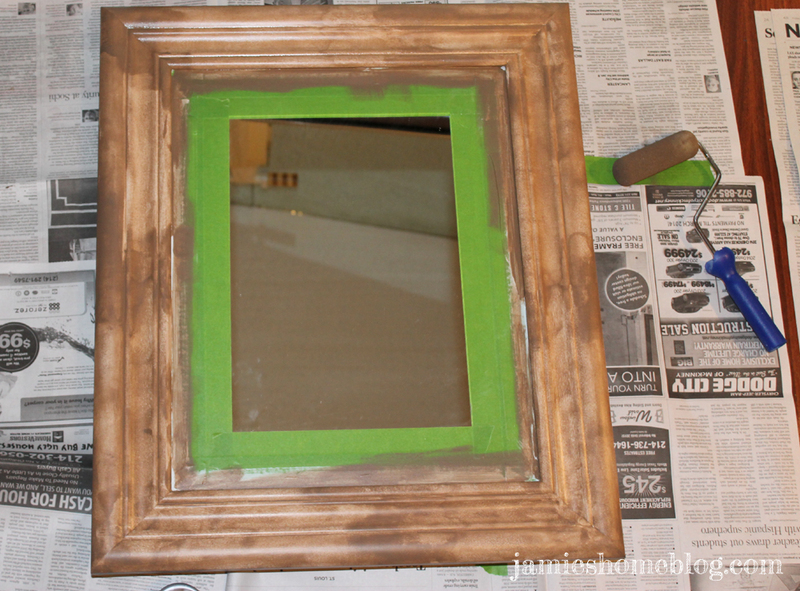 But brush strokes weren’t going to do this mirror any favors. A couple of ounces of Floetrol was enough for my paint sample. I just poured it directly in the little pot, screwed the lid back on tight and shook it like crazy for several minutes. When you paint a dark color over top of white, the first couple of coats are going to scare you. They’re going to look uneven and patchy and you’re going to want to crawl in a hole. Push through these feelings, friend. I promise you, it gets better. My first couple of coats look especially bad here because for some bonehead reason I painted the latex on with a brush and then went over it with a foam roller. I was trying to flatten the brushstrokes as best I could but this method is really only suitable for flat surfaces. Plus the Floetrol does a good job of eliminating brush marks anyway. So after the second coat I abandoned this method and just went with my trusty paint brush. 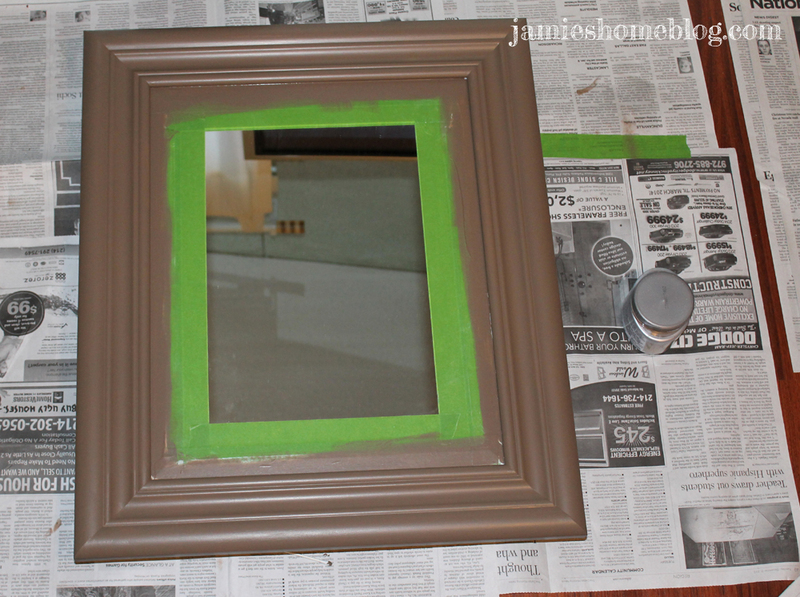 Four coats did the trick for this mirror and I waited an entire day between each coat. 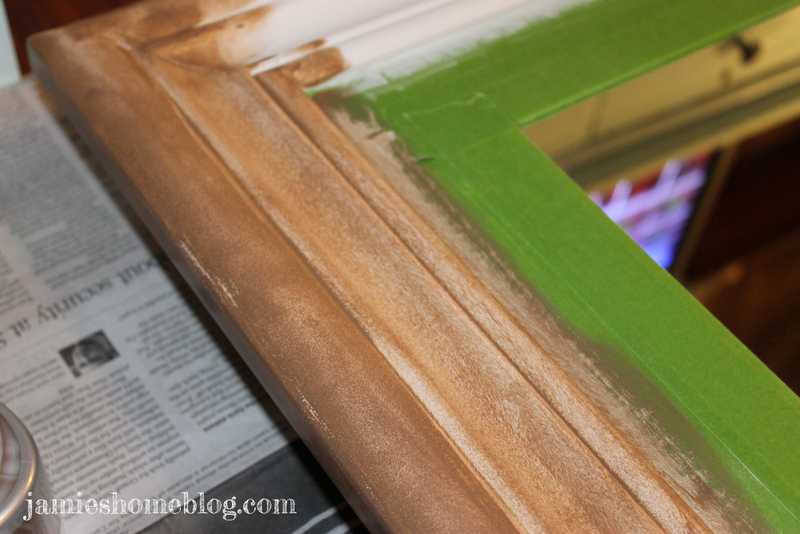 I scored the crease between the tape and the frame with an X-ACTO knife to make sure the tape came up clean. When I pulled the tape away there was a tiny bit of bleed through, but I pulled that up with a steady hand and my X-ACTO. I don’t have an after pic in it’s permanent home in Big Mama’s bathroom (yet) but I hope to update this post with one if I can get her to take one for me. 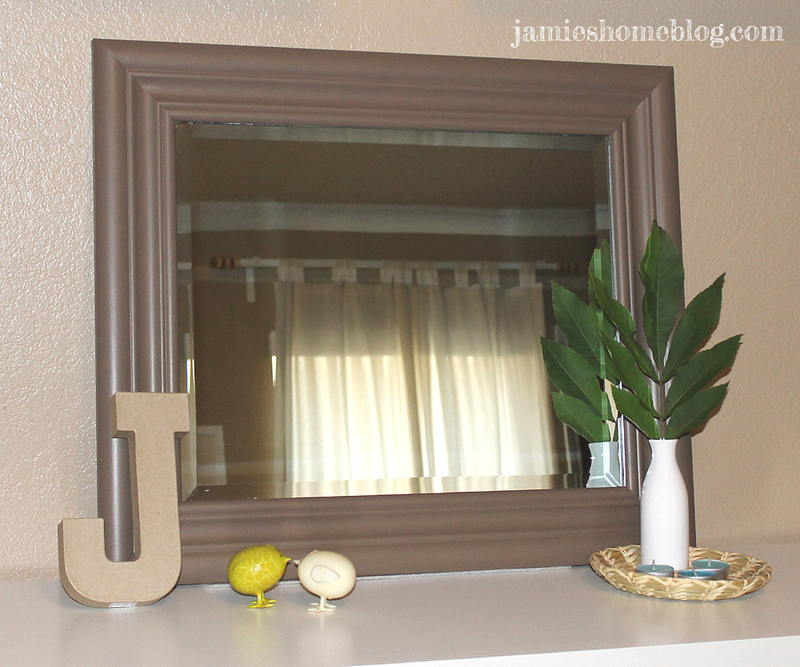 I do have this staged pic – don’t get me started on how difficult it is to photograph a mirror in a badly lit condo. 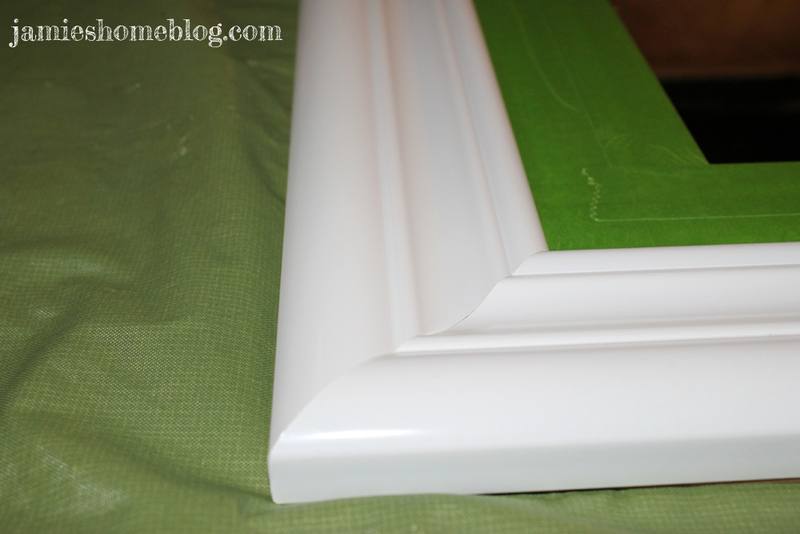 This entry was posted in Decor, DIY, Home Decor and tagged latex paint on plastic, painting on plastic, primer on plastic. Bookmark the permalink. Thanks Linds! I do love my kissy chicks!